All Hallows-by-the-Tower, also previously dedicated to St. Mary the Virgin and sometimes known as All Hallows Barking, is an ancient Anglican church on Byward Street in the City of London, overlooking the Tower of London. The church and Tower Hill play a role in the climax of my current Work in Progress (WIP), a cozy mystery. 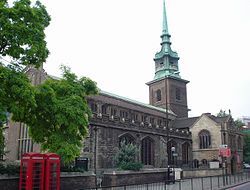 All Hallows-by-the-Tower was first established in 675 by the Saxon Abbey at Barking and was for many years named after the abbey, as All Hallows Barking. The church was built on the site of a former Roman building, traces of which have been discovered in the crypt. It was expanded and rebuilt several times between the 11th and 15th centuries. Its proximity to the Tower of London meant that it acquired royal connections, with Edward IV making one of its chapels a royal chantry and the beheaded victims of Tower executions being sent for temporary burial at All Hallows. Restored in the late 19th century, All Hallows was gutted by German bombers during the Blitz in World War II and required extensive reconstruction, only being rededicated in 1957. Many portions of the old church survived the War and have been sympathetically restored. Its outer walls are 15th-century, with a 7th-century Saxon arch doorway surviving from the original church, which is the oldest piece of church material in London. Many brasses remain in the interior (where one of London’s brass rubbing centres is now located). Three outstanding wooden statues of saints dating from the 15th and 16th centuries can also be found in the church, as can an exquisite Baptismal font cover which was carved in 1682 by Grinling Gibbons for ₤12, and which is regarded as one of the finest pieces of carving in London. In 1999, the AOC Archaeology Group excavated the cemetery and made many significant discoveries. The church has a museum called the Undercroft Museum, containing portions of a Roman pavement which together with many artefacts was discovered many feet below the church in 1926. The exhibits focus on the history of the church and the City of London, and include Saxon and religious artefacts. Also on display are the church’s registers dating back to the 16th century, and notable entries include the baptism of William Penn, the marriage of John Quincy Adams, and the burial of Archbishop William Laud. Laud remained buried in a vault in the chapel for over 20 years; it was moved during the Restoration to St. John’s College, Oxford. The altar in the crypt is of plain stone from the castle of Richard I at Athlit in The Holy Land. All Hallows-by-the-Tower has been the Guild church of Toc H since 1922. The church was designated a Grade I listed building on 4 January 1950. The earliest records of an organ in All Hallows is one by Anthony Duddyngton dating from 1521. This was presumably lost during the English Civil War. 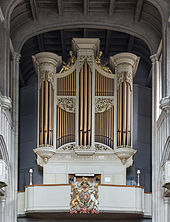 An organ was installed in 1675 by Thomas and Renatus Harris. In 1720 a new case was built by Gerard Smith. The organ was restored and improved by George Pike England in 1813, Bunting in 1872 and 1878, and Gray and Davison in 1902. There was further work by Harrison and Harrison in 1909 and 1928. After destruction in 1940, a new organ by Harrison and Harrison was installed in 1957. This entry was posted in British history, buildings and structures, Great Britain, Living in the UK, real life tales, religion and tagged All Hallows Barking, All Hallows-by-the-Tower, church history, John Quincy Adams, Tower Hill, William Penn. Bookmark the permalink.